Several fig tree varieties originate from Italy, a country with the moderate climate required for growing these trees. Fig trees produce fruit harvests in June through November, depending on the weather. The average height of these trees are 15 to 30 feet when mature, although some trees reach up to 50 feet. Fig fruits usually have dark-brown or greenish skins that are easy to peel. The Paradiso fig tree originates from the northern Italian city of Genoa, so this fig tree is also called a Genoa tree. This tree reaches heights of up to 25 feet when mature. The harvest time for the Paradiso is August and September. This juicy fig has green skin and reddish pulp. Paradiso trees can withstand cold weather as low as 15 degrees Fahrenheit. The Tarantella fig tree's name is derived from Taranto City, a town in southern Italy where the tree originates. When mature, this fig tree's height ranges from 20 to 25 feet. 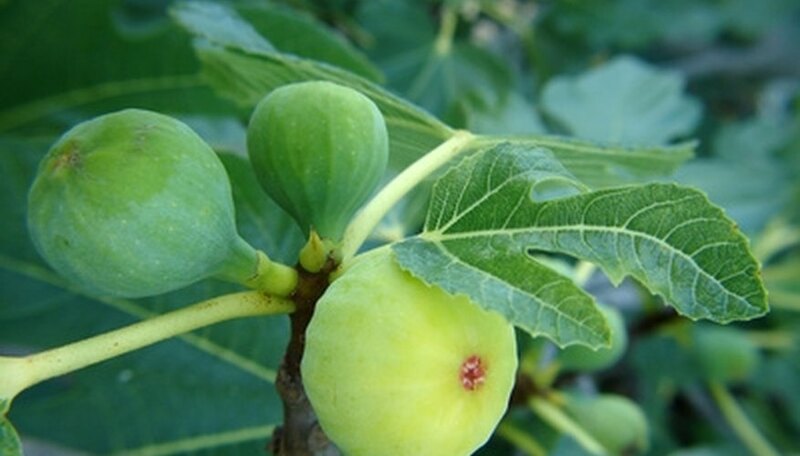 This tree offers two crops of fig fruits in September through early October. The round Tarantellas have brown skin and juicy, sweet fruit. The White Triana fig tree originates from the Triana, a small community in Italy's Tuscany region. This tree grows up to 25 feet tall when mature. The fruit of white trianas have yellowish skin and juicy, reddish flesh. Triana fig trees have an extended harvest time from July through September. The white triana must be protected during the winter when it is first grown. San Pietro Figs grow on San Pietro Island in the Mediterranean Coast, less than 10 miles from Sardinia, Italy. The fig was named after San Pietro, an iconic figure in Catholicism. This Catholic saint's birthday is on the first day this fig tree bears fruit: June 29. The tree continues to bear fruit through September. The first crop of fruit in the summer grows on its own, but the second crop in September requires pollination. The fruit's skin has a dark brown color and its fruit has a reddish color. This tree grows up to 15 to 20 feet.